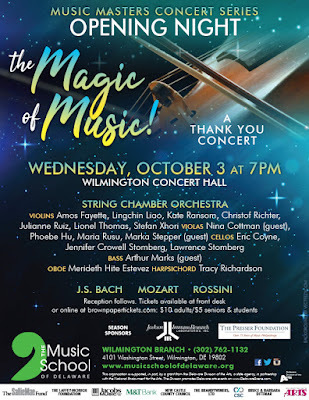 The Music School of Delaware welcomes a new concert season with its first Music Masters performance, Opening Night - The Magic of Music! 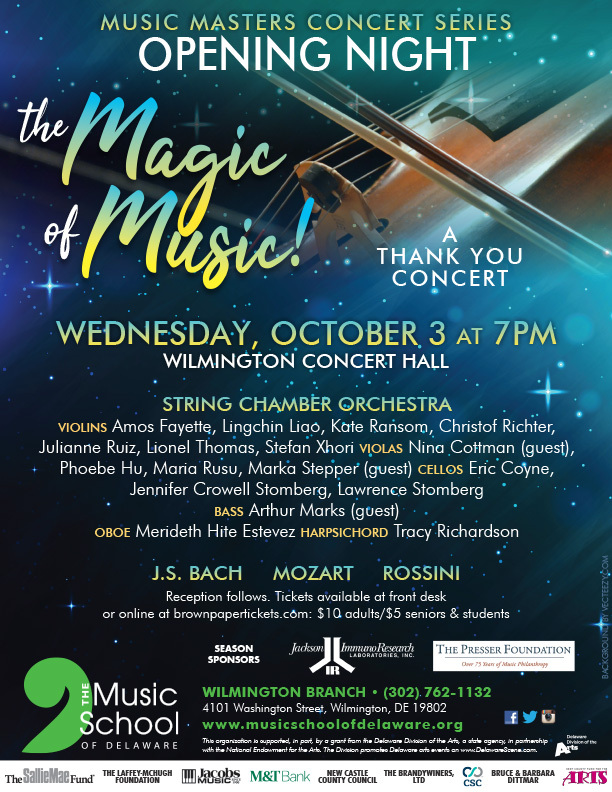 A Thank You Concert, on Wednesday, October 3, at 7:00pm at its Wilmington Branch at 4101 Washington Street in Wilmington. The musical event is a thank-you performance for its families, faculty and donors, with an 'all-star orchestra' of its distinguished faculty as well as guest artists from regional ensembles and orchestras. They will perform noted works by Rossini (String Sonatas #2 in A Major and #3 in C Major), J.S. Bach (Concerto for Oboe and Violin in C Minor) and Mozart (Eine Kleine Nacht Musik). Soloists on the program are violinist Christof Richter and oboist & Meredith Hite-Estevez, who are both on the faculty of the Music School. The complete orchestra also includes Violins: Amos Fayette, Kate Ransom, Stefan Xhori, Julianne Ruiz, Lionel Thomas and Lingchin Liao; Violas: Maria Rusu, Nina Cottman, and guest Marka Stepper; Cellos: Jennifer Stomberg, Eric Coyne and Lawrence Stomberg; Bass: Arthur Marks; Harpsichord: Tracy Richardson. Tickets for the event are only $10 or $5 for students and seniors and may be purchased at brownpapertickets.com. The Music School boasts of busy fall of performances, both student and professional. Additional Wilmington Branch professional concerts will feature the music of the 1930s; the 50th anniversary of Woodstock; and an annual Martin Luther King, Jr. celebration. Additionally, faculty recitals at both Wilmington and Milford Branches will be presented throughout the season. The Wilmington Community Orchestra, under the baton of Tiffany Lu, will perform works from Mozart to Mahler. Alumni return to share their musical stories in concert. And, the school continues to host its Classical Cafe sessions (complimentary coffee and donuts included) where attendees engage in lively discussion with faculty on music-related topics. The Music School also hosts and presents events from classical to rock, including Open Mic Nights, a monthly Bluegrass Jam, and jazz and rock ensemble performances. It is the mission of The Music School of Delaware to provide excellence in music education, training and experiences for people of all ages and levels of ability. Founded in 1924, The Music School of Delaware is a nonprofit organization that reaches thousands of new people from Delaware, Pennsylvania, New Jersey and Maryland through its instructional programs and over 100 public performances each year. The Music School is the only nationally accredited program of its kind in Delaware and is the only statewide accredited community music school in the nation. The Music School offers standard-setting instructional programs for all ages and has a faculty of nearly 100 expert artists and educators with branch locations in Wilmington and Milford and over 20 satellite and outreach sites statewide. For more information, please call the Wilmington Branch at 302.762.1132, the Milford Branch at 302.422.2043 or visit the website at musicschoolofdelaware.org.